Kaziranga National Park is a well known national park of India situated in between two districts of Assam - Golaghat and Nagaon. The park is located on the banks of river Brahmaputra. It has been declared as a world heritage site by UNESCO. It covers an area of about 430 sq km. The park is a home to two-thirds of one-horned rhinoceroses of the world. The Forest Department of Assam published the latest census of March, 2015 which recorded the population of Rhinos in Kaziranga National Park to be 2401 out of which 1,651 adults, 294 sub-adults, 251 juveniles and 205 cubs are recorded. Along with the recognized wildlife NGOs, the department conducted an operation to preserve wildlife. Kaziranga was declared as a Tiger reserve in the year 2006 as it had the highest density of tigers of all the protected areas in the world. The park also shelters huge breeding populations of elephants, swamp deer and wild water buffalo. It is also recognized as a prominent birdlife area by Birdlife International for conserving varied species of birdlife. The vast area of Kaziranga comprises of tall elephant grass, dense tropical broadleaf forests and marshland. Four major rivers including the Brahmaputra River crosses the Kaziranga. The park also has several small water bodies. In the year 1905, it was established as a reserve forest and celebrated its centennial in 2005.. The rich variety of flora in Kaziranga attracts millions of tourists every year from all over the world. The national park is surrounded by the floodplains of River Brahmaputra that helps in the nourishment of the major plants, animals and bird species of this region. 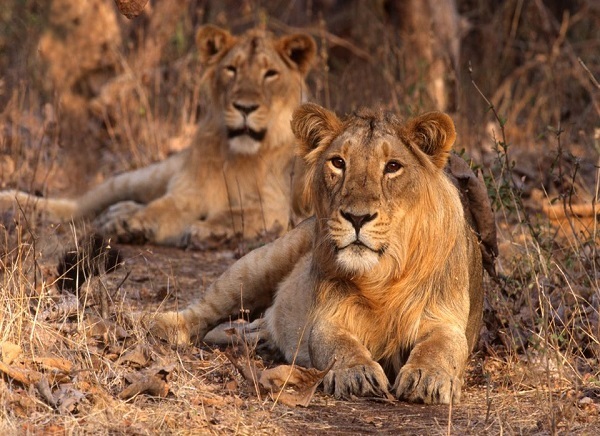 It has been titled as a "Hotspot of Biodiversity" in India because of its rich diverse species and their omnipresence. Kaziranga National Park’s vegetation comprises of three major types such as grasslands on alluvial plains which includes tall elephant grass and short grasses as well along with tropical wet and semi-evergreen forests. The array of charming flowers adds glory to the vegetation of Kaziranga. Therefore, the aquatic flora includes lotus, water lilies and water hyacinth creating a beautiful ambiance. There are some species of climbing plants as well that enhances the outlook of the park. According to the survey of flora undertaken in 1986, the vegetation of Kaziranga includes 4% is Swamplands, 6% Sand, 8% of rivers & water bodies, 11% Short Grasses, 29% open jungle, 41% of tall elephant grasses. Kaziranga is known as the home to the world's largest population of one-horned rhinoceros. 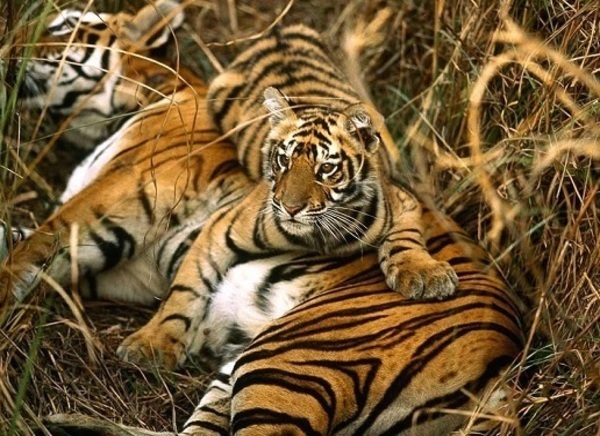 It also shelters the highest density of tigers in the world and therefore it became a Tiger Reserve in the year 2006. The park is inhabited by major populations including 35 species of mammals, out of which 15 are considered as endangered species by the IUCN Red List. 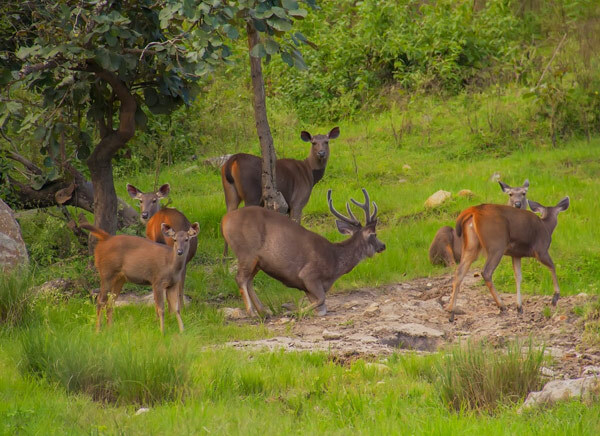 Elephant, wild Asiatic water buffalo and swamp deer are found in abundance in the park. The tropical and dry deciduous forest of Kaziranga also shelters Gaur and Sambar. The other known species are found in the park are Fishing Cat, Leopards and Jungle Cat, small Indian Mangoose, Gray Mangoose, Hispid Hare, Golden Jackal, Bengal Fox, Sloth Bear, Civets, Chinese Pangolin and Indian Pangolins etc. Kaziranga is recognized as a prominent Bird Area by Birdlife International for conserving of avifaunal species. There are 479 species of migratory & resident birds out of which 25 are globally and 21 are locally threatened species. As compared to other protected areas of India, Kaziranga National Park has been developed remarkably. Besides, the park is also a refuge to 42 species of reptile which includes the about to extinct species like Assam roofed turtle and gharial. The endangered Ganges Dolphins are sheltered in the floodplain of River Brahmaputra. Kaziranga National Park experiences three major seasons of summer, monsoon and winter. The summer in Kaziranga lasts from February to May. The dry and windy summer of Kaziranga has a varying temperature of 7°C to 37°C. The monsoon in this region remains hot & humid and extends from June to September. The South West monsoon brings 2,220 mm rainfall in Kaziranga. The mid-valley of Brahmaputra is considered to be one of the rainiest places in the world. River Brahmaputra overflows resulting floods in the Kaziranga National Park, which maintains the biological balance of the park. But the park becomes accessible during monsoon. Kaziranga enjoys its winter from November to January with a temperature varying from 5°C to 25°C. The winters remain mild and dry in Kaziranga. The best season to enjoy at Kaziranga National Park is between November and April. Kaziranga National Park offers two exclusive safaris like Elephant Safari and Jeep Safari that gives extensive view of the wilderness of Kaziranga National Park. An Elephant ride through the jungle of Kaziranga National Park will give you a better view of rhinos & other wildlife. The elephant safari is organized by the Forest Department twice in a day (morning and evening). 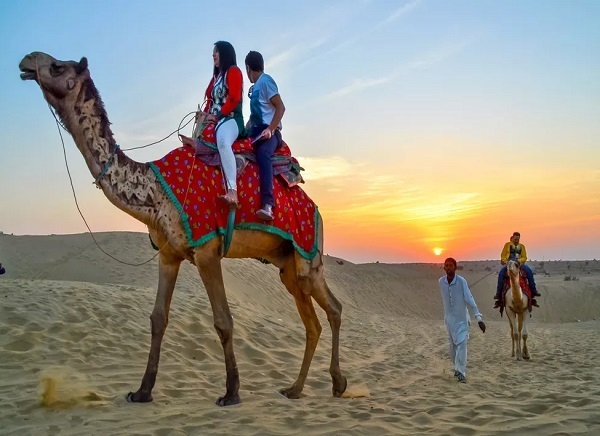 The elephant safari allows only four tourists and a mahaout at a time. The safari charges include riding charges, and entrance fee. Camera fee is optional and you need to pay if you are carrying. One has to be at the pick-up point through a jeep in order to take the elephant ride. You will return back in the similar way. 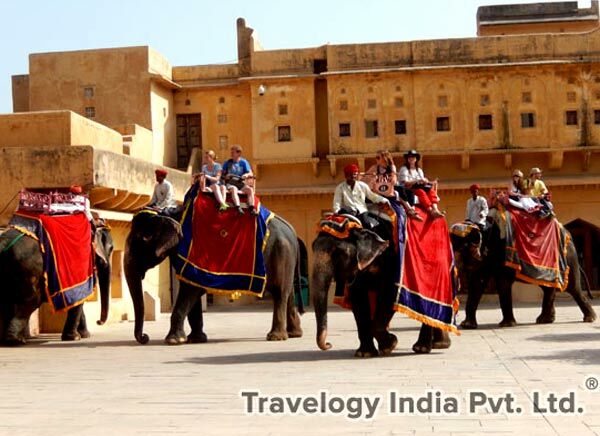 To avoid hassle during the last moment, one should do advance booking of elephant safari. Priority is given to Western Range (Bagori) so that one can get the sight of Indian one-horned Rhinos. Besides viewing the rhinos, the safari provides opportunities for photography amidst the marshy areas and Donga Lake. Check out these North East India wildlife itinerary covering Kaziranga and Sundarbans. 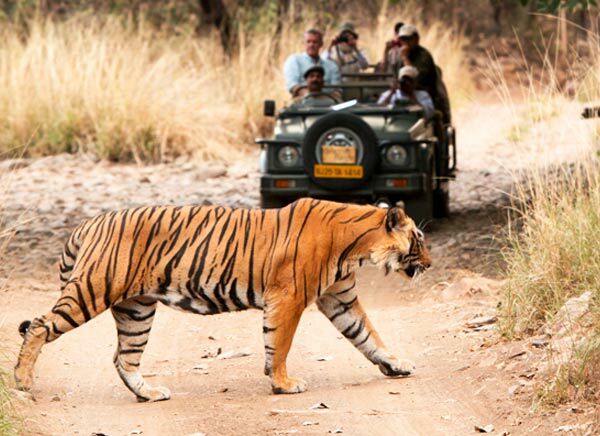 Jeep Safari Like any other tiger reserve or wildlife sanctuaries one can enjoy jeep safari in Kaziranga also. 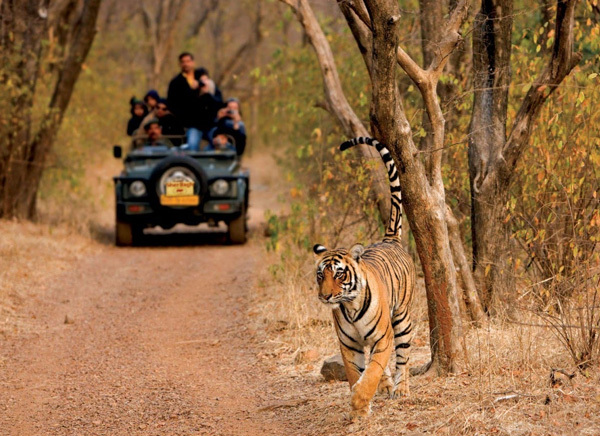 The forest department arranges two shift of jeep safari for its visitors. The jeep is allowed to carry 6 persons at a time. Jeep safari can cover large area than the elephant safari. The jeep safaris can be booked nearby range headquarters. Note: The park management can change the timing for safari as they have the right to do so. A Jeep Safari can be enjoyed either in the morning from 07:00 Hrs to 09:30 Hrs or in the afternoon from 13:30 Hrs to 15:30 Hrs. Kaziranga National Park, the famous reserve for rhinos can be easily accessed through all modes of transport so tourists from worldwide visit the park in large number every year, to experience the exotic wilderness of the park. Airways : The nearest airport to Kaziranga National Park is at a distance of 96 km in Jorhat town. Another airport closest to the park is at Guwahati, 225 Km away to the west of Kaziranga. Regular flights operate from these airports connect the city with the major cities of the world and major Indian cities. Railways : The nearest railhead to Kaziranga is 80 km away at Furkating on east. It is connected by trains to all the major cities of the world and the country. One of the major railway stations nearest to the city is Guwahati railway station. Another railway station, which is located at distance of 40 km, is at Jakhalabandha that operates a train once in a week. Roadways : Kaziranga is well connected with the major cities of the world and within the country through roadways as it has NH 37. Several public and private buses run on the roads. Here is a list of some major cities and wildlife sanctuaries near Kaziranga and their distance from this world famous rhino reserve. In 1904, Lord Curzon (the Viceroy of India) with his wife Mary Curzon went for an excursion into the Kaziranga Wildlife Sanctuary in search of one-horned rhinos but didn’t find any as they were poached. Since then, Mary Curzon decided to take some measures for the conservation of rhinos. Therefore in June, 1905 she came up with the idea of extending the area up to 232 sq km and by converting Kaziranga into a forest reserve. A present the park shelters around two-third of great Indian one-horned rhinos of the world. In the year 2006, Kaziranga was declared as a tiger reserve with the highest density of tigers in this region. e park also boasts has large breeding populations of elephants, wild water buffalo and swamp deer. In addition, Kaziranga is recognized as an 'Important Bird Area' by Birdlife International for the conservation of avifaunal species.